If your Association Office has sold-out of numbers for your original 500 Club draw and decide to open a second 500 Club for all the people on the waiting list, here's some advice. Ensure your second set of numbers don't accidentally get "mixed-up" with the original numbers, because if you do, you will end up with duplicated numbers and you won't have a clue who has won. Fortunately the error was spotted before the next draw! ...ie, sorting through 600 orange balls and picking out the 100 duplicates. Or, as Gill (the lady above) said, "When I arrived at the office today, the last thing I thought I would be doing is playing with the agent's balls." Quite! 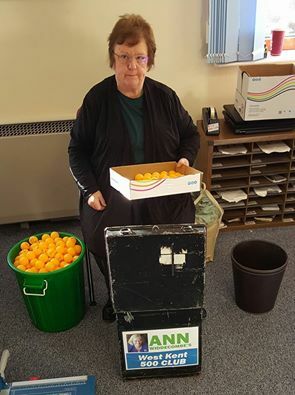 My thanks to Jane and James Scholes, Sue Nuttall, David and Catherine Adams, Jeff and Brenda Tree, Gill Levine, Glynis Coates, Owen and Chris Baldock, Keith Ferris, Joseph Mamo, Margaret Thompson, Thelma Huggett, Vivian Branson and Janet Sergison. 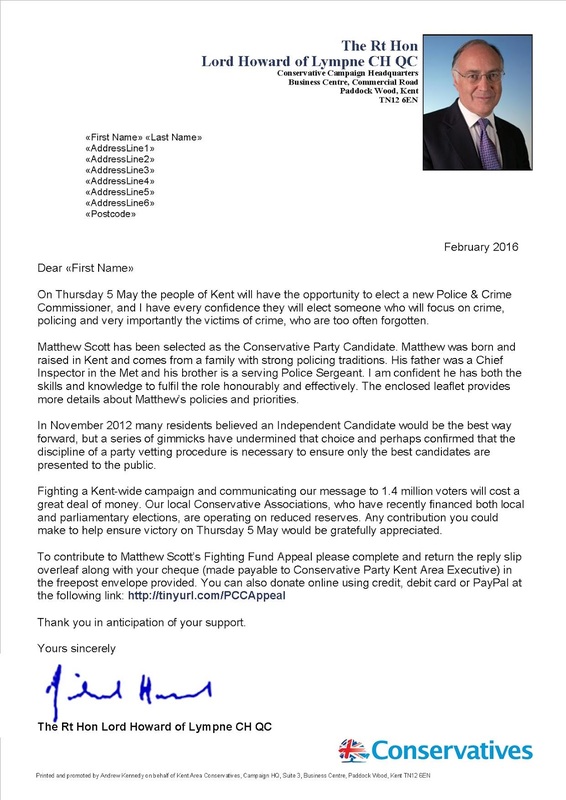 ....and commence work packing 5,300 fighting fund letters for the Kent Police and Crime Commissioner Campaign. Then finally, a meeting with Kent County Council Conservative Group to sign-off the biggest direct mail campaign we have ever managed at West Kent. 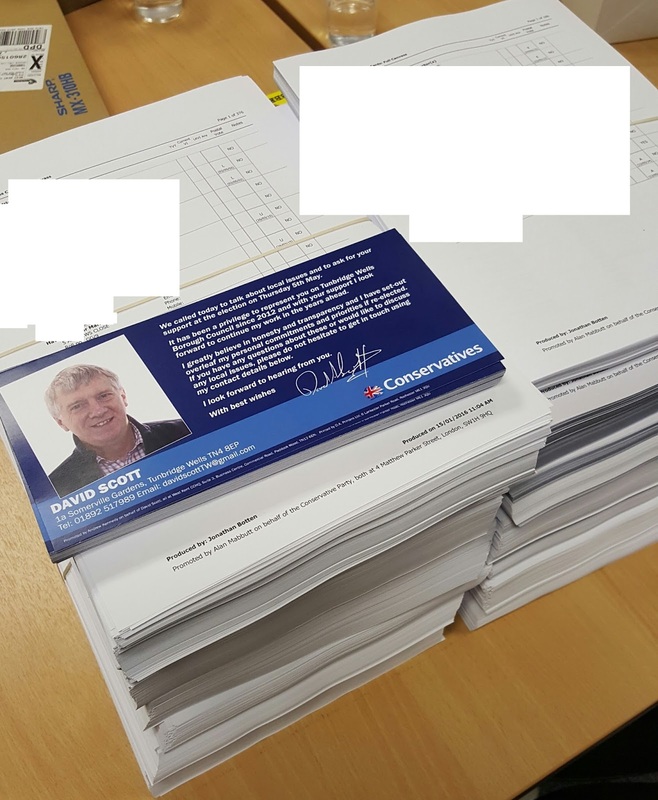 100,000 letters to Conservative pledges encouraging them to sign-up for a postal vote. People join political parties for many reasons; personal identity, to campaign for (or against) something, to support their beliefs financially, to bring about change, to seek elected office for themselves, to expand their social circle - and some to debate and help shape policy. Whilst each brings value and attracts different people we must remember that everything we do should be directed towards the single goal of winning elections. Like many campaigners I am often frustrated by those who think that sitting around and "talking about it" is a replacement for talking to voters on the doorsteps. This is not to say that many involved in our Policy Forums do not pull their weight as campaigners, but it is fair to say (at least in West Kent) that few of those whose names come up most regularly in the discussion group minutes are regularly seen tramping the streets at election time. For me, the nadir came several years ago during a fiercely contested by-election fought in the bleak winter snow. As I accompanied the local Chairman and MP around the streets for a final 8pm "Knock-up" we saw through the windows of the local Constitutional Club around 20 of our members talking about the latest CPF Policy Brief. I popped in to appeal for help, only to be castigated by the chairman (herself a councillor) for not attending her discussion and stopping the MP and Chairman from attending too! 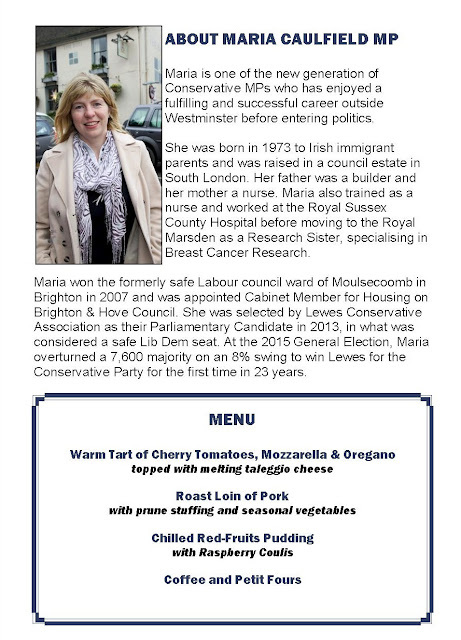 Apparently she did not see why her meeting should have been cancelled or postponed as it was "in the diary before the by-election was called." I suspect the bluntness of my response was not appreciated, but at least it has saved us both the cost of sending each other a Christmas card ever since. I was therefore delighted to hear that my good friend Dr John Hayward has just been appointed as Conservative Policy Forum (CCF) Manager by CCHQ and will be working alongside Hannah David to relaunch the Forum and make it more relevant. I first met John 12 years ago when he and his family moved to Tonbridge. John is one of the most intellectually astute people I have ever met, but despite having a first-class academic brain he is also a grafter. He made it his personal mission to win the last remaining Labour council seat in Tonbridge and worked tirelessly with our local candidate to do so. John's intellectual capacity and ability to solve the most complex political and mathematical questions continues to astound me. I once needed a macro which would divide households based on gender and household size and he created one in 20 minutes, which worked perfectly. To my shame I must admit that I did not understand the explanation of how it worked let alone how it did actually worked! John's enquiring mind, together with his evidence-based research background, will make him the ideal person to promote the policy debate. But, just as importantly, he will approach this task as a long-term Party activist who both understands the Voluntary Party and the role it should play. If there was ever an appointment which could be considered a round peg in a round hole, this is it. I wish John and Hannah David every success, and in doing so send a message about how I feel the CPF could be improved. 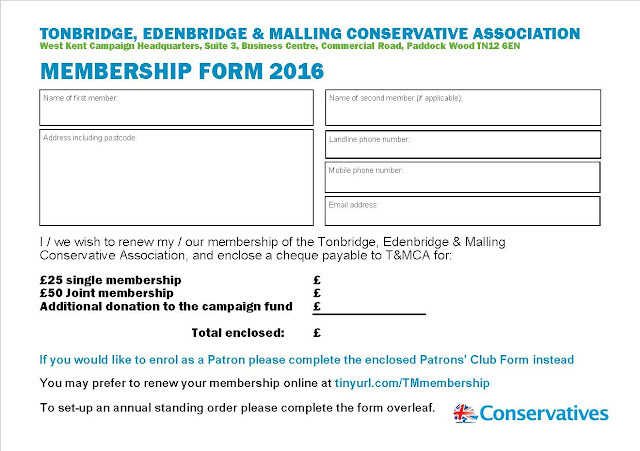 I hope it can be used as a vehicle to reach out beyond the Conservative Party, to involve all those who share our broad vision, but are not necessarily paid-up members. By this I mean using CPF to involve churches, youth groups, small businesses, carers and the hundreds if not thousands of organisations which keep the wheels of civic society turning, rather than just as a talking-shop where we sit around in draughty halls talking to each other. If they achieve that then CPF will become a very valuable tool in not only redefining and developing policy but also expanding our intellectual base. News of Boris Johnson’s imminent visit to West Kent reminded me of the first time the Mayor and I met. It was the 2011 Party Conference in Manchester. Discussions about the boundary review were in full flow and there was concern that a number of people in Kent held “unhelpful” positions which may have resulted in conflicting submissions to the Boundary Commission. 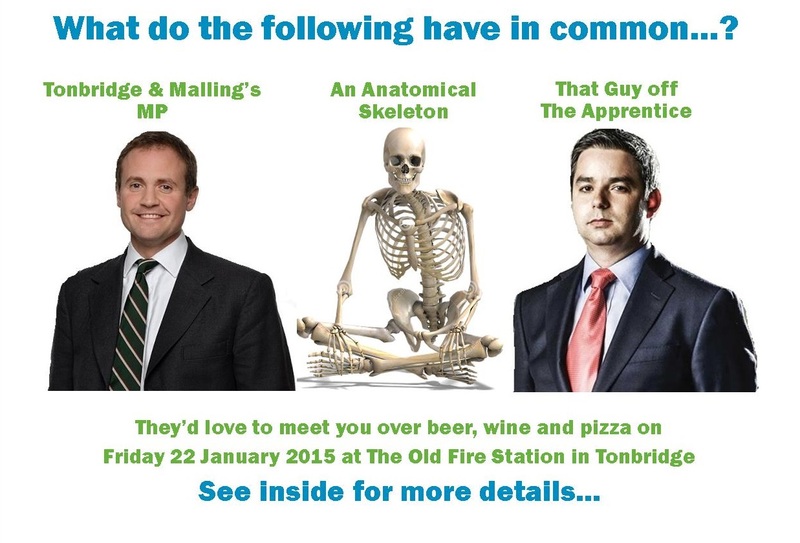 It was suggested that I got together with Steve Bell (then South-East Regional Chairman) and the two CCHQ apparatchiks responsible, but, as ever, finding a time when all four were free during Conference week was proving difficult. Monday night, however, we all found ourselves at the Regional Reception at the Midland Hotel. Trying to have a confidential chat in a room of 2,000 people was proving difficult, due to constant well-intentioned interruptions. I opened a near-by door to see if it led to somewhere quieter; it did. It was an unlit utility room stacked high with banqueting chairs, mop-buckets and all the detritus that hotel management want to keep hidden from their guests. Quietly we slipped inside and continued our discussions in the pitch-black – with the chinking of glasses, and the guffawing of inebriated representatives just a few feet away. Suddenly we heard the great man being introduced – so we concluded our discussions and attempted to slip back into the room, hopefully unnoticed. What we didn’t anticipate was that the microphone at which Boris was speaking had been placed 3-foot from the door from which we were emerging. Our hopes of a clandestine withdrawal were completely scuppered as we saw the entire room staring in amusement at four red-faced men shuffling out of the darkness and blinking in the light. A bad situation, however, was going to get worse. For Boris spotted the open goal, and couldn’t resist scoring. “Come on, chaps! Come out of the closet, and get a drink!”. And that, dear readers, is the story of the only night that Steve Bell and Andrew Kennedy were found in the closet! 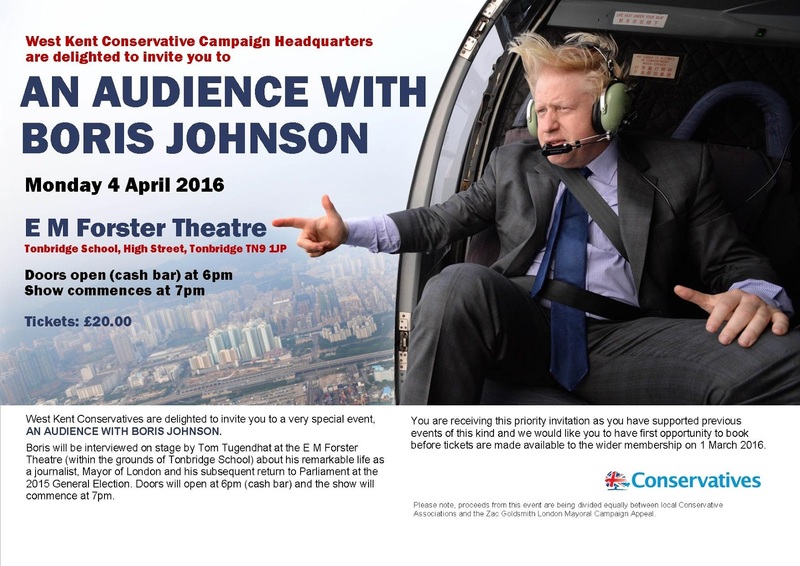 He will be interviewed on stage by Tom Tugendhat MP at the E M Forster Theatre at Tonbridge School. Tickets for this event will sell fast, so we have tonight sent a special invitation for priority tickets to the 140 members who have supported our previous An Audience with..... events. It's only fair that those who have supported these events from their inception are given a chance to book before the madding crowds. 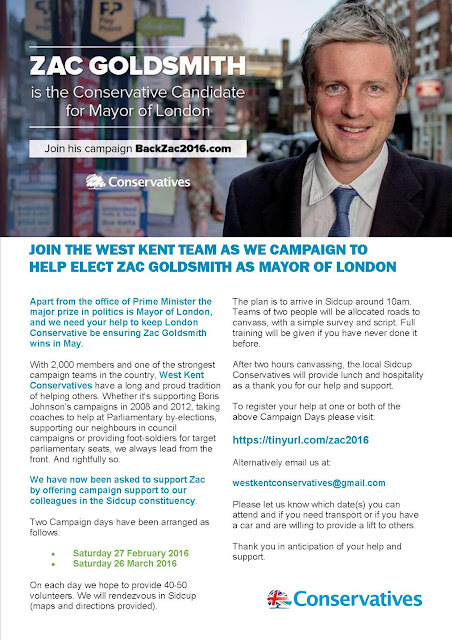 West Kent will be donating 50% of the tickets proceeds to the Zac Goldsmith Campaign Appeal. Tunbridge Wells MP, Greg Clark, called into West Kent Towers this evening to attend a local election strategy meeting with our super team of TW council candidates. 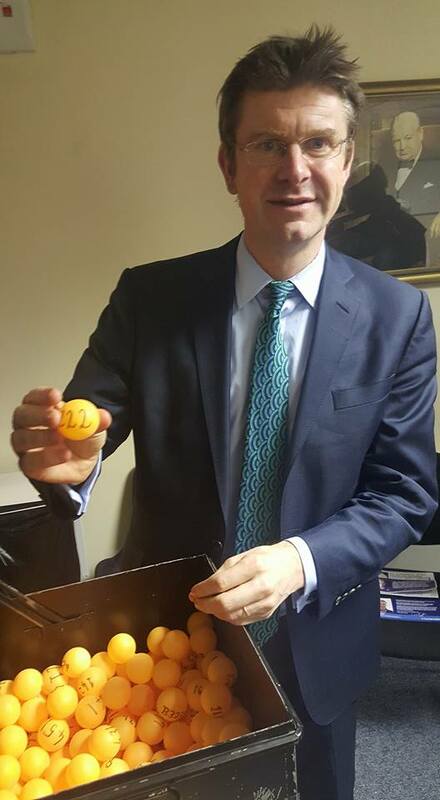 Whilst there (and in front of a small audience) we invited Greg to draw the February 500 Club winner - which was ball 222, owned by Tonbridge & Malling Treasurer, Alan Bristow. Congratulations Alan - the cheque's in the post! 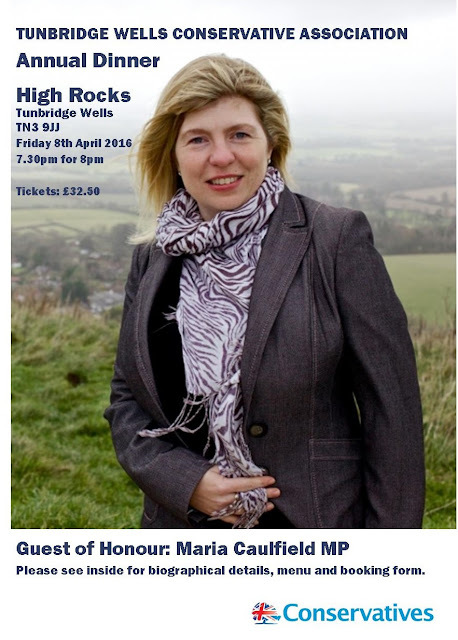 Tunbridge Wells Conservatives are delighted to be welcoming Maria Caulfield MP (Lewes) as Guest of Honour at the Association's Annual Dinner. 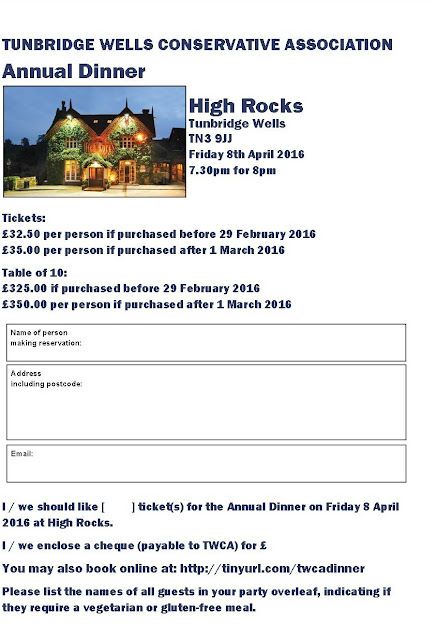 This will be held on Friday 8 April 2016 at the High Rocks in Tunbridge Wells. Tickets are £32.50 if purchased before 29 February 2015 or £35.00 thereafter. This is for a three course meal including coffee. Reception drinks (cash bar) from 7.30pm with dinner served at 8pm. There will be an auction and a raffle. To reserve tickets please send a cheque (payable to TWCA) to West Kent Campaign HQ, Suite 3, Paddock Wood Business Centre, Commercial Road, Paddock Wood TN12 6EN. Alternatively, the fastest and simplest way to book is online using a credit/debit card or PayPal by clicking below. Please note online bookings include a £1 fee to cover costs and interest charges. Here we go again..... ! We must be heading towards local elections! All local government, regardless of which party is in control, is living through difficult times. Reductions in central grant, tax increases capped at 1.99%, increased demand on services and the constant demand to do "more for less" all take their toll. I was disappointed to hear from a friend that at the recent annual finance meeting of a local council, with councillors going through expenditure on a line by line basis, few objections were raised to any of the proposed increases in charges, but my colleague's suggestion to show solidarity with hard-pressed taxpayers by proposing the abolition of the council's £7,000 per annum "civic hospitality" budget caused uproar. One councillor even suggested that he had no right to such an opinion as he hadn't been on the council long enough to hold such an impertinent view. In fact, such was the anger and opprobrium pouring down on my colleagues (from his so-called political friends) that four other councillors (a quarter of those present) emailed him afterwards to apologise for their colleagues' behaviour and rudeness. 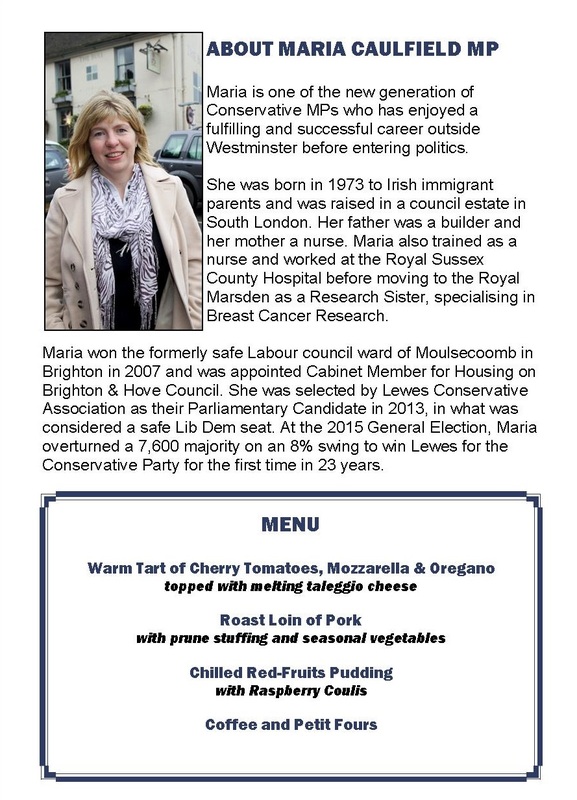 In these circumstances I compare the actions of the council with our own prudence at West Kent Conservatives. Both organisations take money from others and spend it on their behalf (though in the case of West Kent people have a choice, in paying their local Council Tax they don't). Jon and I always buy the tea and coffee personally and we even paid our own way at the Office Volunteers' Christmas Lunch. If we host a reception here (for candidates or helpers) we raise sponsorship for the food and drink. Neither of us claim travel expenses and whenever we attend branch or Association events we always pay full price for our ticket and pay our way when we get there with the raffle. I accept in the grand scheme of things £7,000 is not a lot of money, but when councillors vote to increase car parking charges, reduce services and freeze staff wages,spending the combined Council Tax of 44 families on prawn vol au vents and White Burgundy is not setting a very good example. Later this month we are launching Tom Tugendhat's "young supporters network" at a special event in Tonbridge. 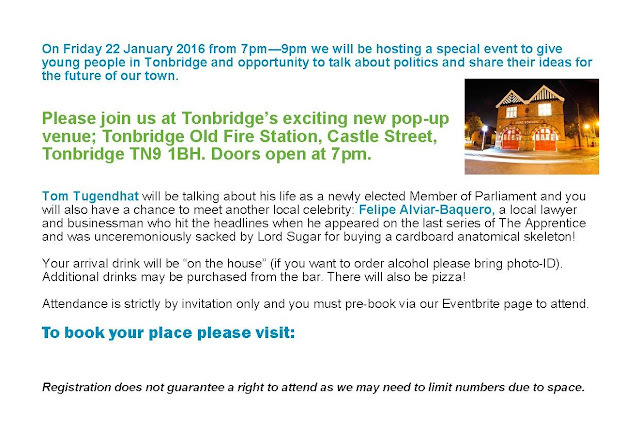 This will be a forum for like-minded young voters to meet Tom and talk about their hopes and aspirations for the future, and for Tom to hear their suggestions for the future of Tonbridge. 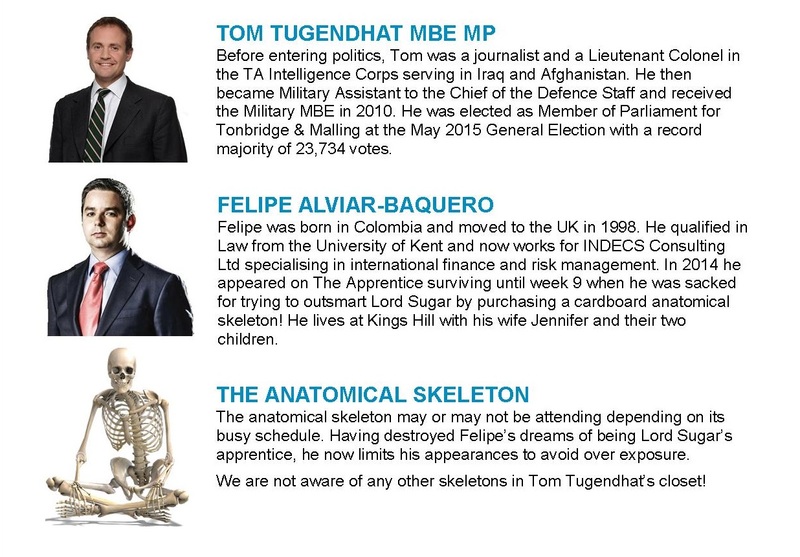 We are delighted that Felipe Alviar-Baquero (a local member who appeared on last season's edition of The Apprentice) will also be joining us, though whether he brings his ill-feted "anatomical skeleton" remains to be seen! If you would like to attend please email the Conservative Campaign HQ at tonbridgeconservatives@gmail.com and I will send you a link to book online. 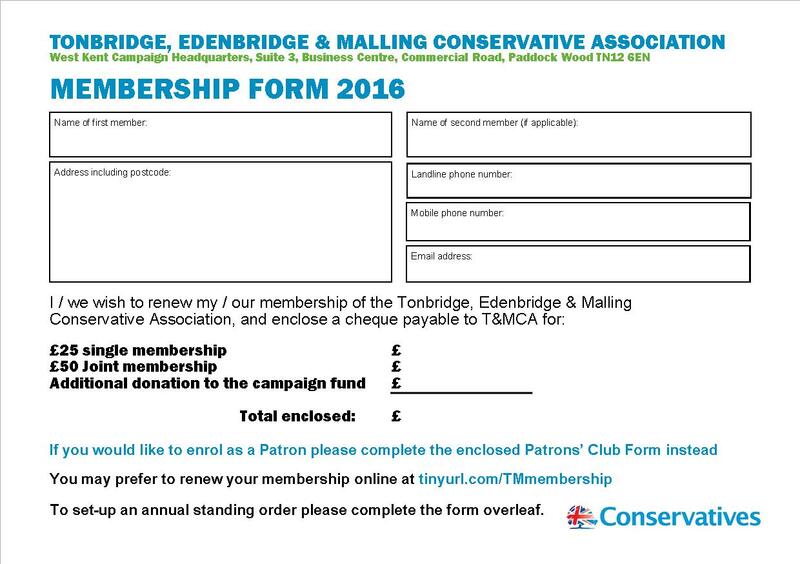 Like Conservative Party offices throughout the country, the first task of the New Year is to send the annual membership renewal letters to the 70% of members who pay their membership subscription in the first quarter of the year (in the case of West Kent that's about 1,500 people!). 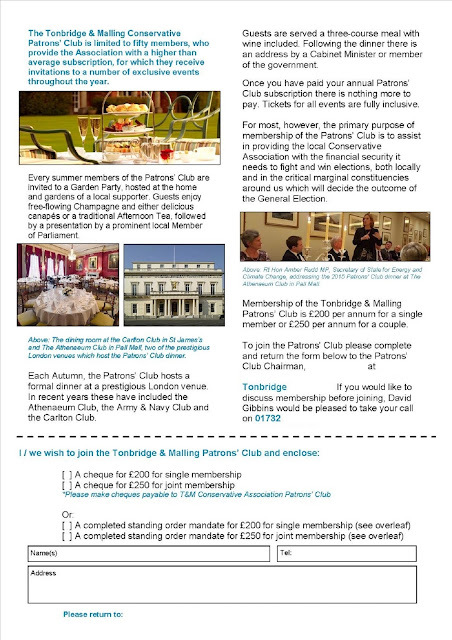 This year we are using the membership renewal mailing to relaunch our Patrons' Clubs - to attract new members to the three Patrons' Clubs already running (Tonbridge & Malling, Tunbridge Wells and Chatham & Aylesford) and to launch new Patrons' Clubs in the two constituencies which do not have them (Maidstone & The Weald and Faversham & Mid Kent). As always with such appeals for financial support, I try to strike a wholly positive note. In majority seats such as ours it is important that our members and donors know their support is making a real difference - and that includes supporting less well-off marginal constituencies nearby. 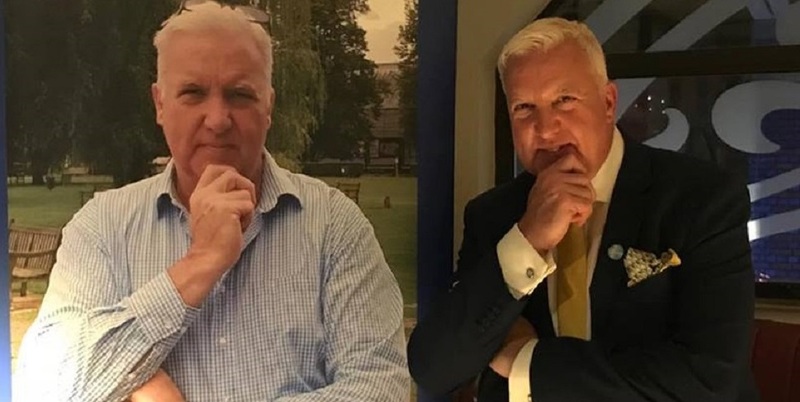 We can all look back to halcyon days when almost every constituency had an office with a full time agent and secretary, but those days are gone. And let's be honest, even if an Association had the money to finance such an indulgence, new technology has changed the job so much that I don't think even two constituencies would provide sufficient work to keep two f/t members of staff efficiently employed, unless that had additional external duties on top. As I travel the country speaking to Associations, County Committees and Regional Conferences (and so far I have been to around 50) my presentation is met with warm applause, considered questions and genuine enthusiasm along with a determination to make it happen. But the sad reality is not a single new Group has yet been formed. I fear the enthusiasm of the campaigners and the progressives is overwhelmed by those whose primary concern is control of the key to the crockery cupboard. 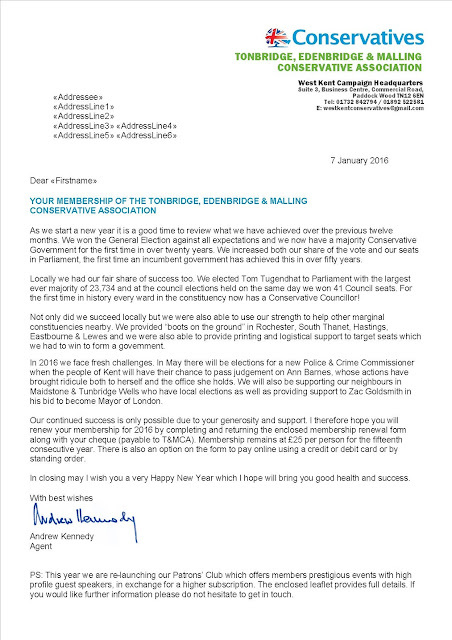 Associations are understandably concerned about their independence from CCHQ, just as branches like to stake a similar claim to independence from the Association, but in fact this is hokum. The reality is we are a national party and a national brand. Just as Marks & Spencer and Dynorod are too, and if the local Dynorod man pumped sewage all over your Grandmother's carpet the ensuing publicity would damage the brand, not the individual van driver. The same goes for political parties too. A degree of local / self management is right and proper, but with that goes duty and responsibility. Local M&S managers can hire their own staff, amend their opening times to suit local trading traditions and maybe even adjust their stock levels - but they couldn't paint their stores pink, decide against selling coats or to divide-up the trading week with their competitor so each store can have three days off. Yet many local Associations think they can use non-party fonts and colours in publicity, fail to follow proper selection processes and refuse to campaign. And ironically, almost without exception, it is the failing Associations who are loudest in demanding "autonomy" no doubt hoping a locked front door will hide their failings. If the Association met a minimum standard across all disciplines (or achieved an average pre-determined score) they would be allowed to continue as a 'stand alone' Association. If the Association failed then they would be given six months to improve and if such improvements were not achieved they would be placed into a Grouping so such improvements could be made. 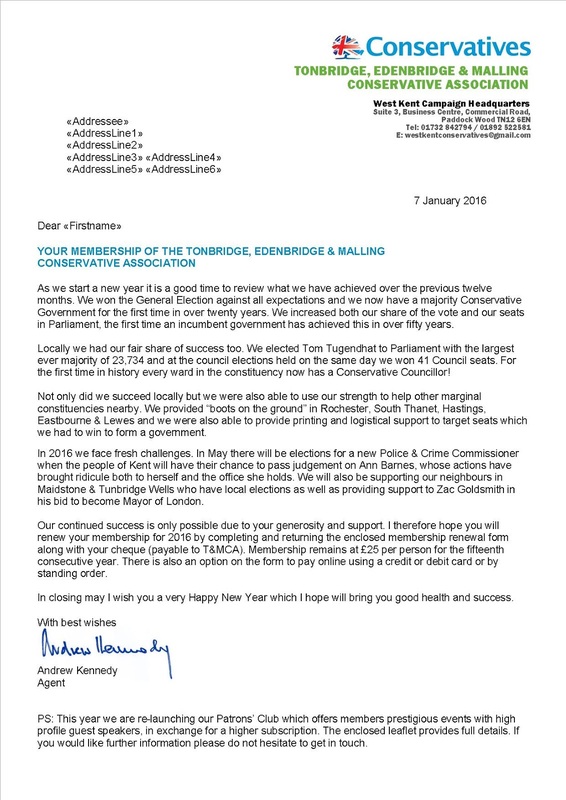 "At times I wring my hands in frustration as CCHQ say "grouping is a local decision." When plainly it should not be. We have great volunteers and we could not exist without them. However, Darwin said that it was not the strongest that survived, but the most adaptable. If we continue as we are and not adapt I fear for our future." A very good article on ConHome this morning from my friend Matthew Plummer, on why 5 yearly boundary reviews will make our existing Association model almost impossible to maintain and how groupings such as we have in West Kent are the obvious and sensible solution. Matthew Plummer is a commercial photographer. Many constituencies have retained the same basic shape for decades. Tooting – my patch – has been essentially been the same since it replaced Wandsworth Central in 1974. Yet the reforms likely to be in place for 2020 will require the number of electors in constituencies to adhere to a much tighter variation from the national average, and for this to be reviewed every five years.Boundary reforms don’t normally make for gripping political news: they’re the stuff of the Conservative Association stalwart or eagle-eyed agent, and definitely not for people with healthy social lives. But whether we like it or not, the Boundary Commission’s regular redrawing of the electoral landscape from 2018 onwards will revolutionise the culture of our local associations. Regular readers of this blog will know I am a moderate Eurosceptic. As a Libertarian I support free trade and free movement of people. I have lived and worked in Amsterdam and Spain and have no fears of other countries, their people or traditions. Nor have I ever feared Britain's culture being "swamped" any more than the people of Spain should fear the British ex-pats on Costa swamping Andalusian culture with their demands for All Day Breakfast por favor whilst reading the Spanish Edition of the Daily Mail. My opposition to the EU is not an emotional spasm based on patriotism or fear of the unknown. I oppose it because I simply believe it is doomed to fail and that we can do so much better alone. The history of the 20th century is littered with the economic (and too often human) scars of mankind's attempts to control the free market; Bretton Woods, the Gold Standard, the ERM and of course EMU. Each failed and left behind a legacy of debt, misery, depression, and even bloodshed and conflict. Yet we are making the same mistakes again. I have no formal position on the campaign, though I have let it be known that provided my day job allows and my employers consent, I intend to take leave of absence to campaign for Britain to Leave the EU. Should the Leave campaign fail, the show will be over; it will be a generation before the issue can be revisited and by then the relentless propaganda and the ratchet effect of the EU bureaucracy will make winning a vote almost impossible. In reality, it's now or never. I am pleased that the main Leave campaign is being run by people with a proven track record. Matthew Elliot is widely respected through his work on Big Brother Watch and the TPA. Stephen Parkinson I know slightly from my work on Police & Crime Commissioners. Both were key players in the outstandingly successful NotoAV Campaign, which saved our country from perpetual coalition government. There is however a big difference between NotoAV and the Leave campaign. NotoAV was held on the same day as the local elections and was officially endorsed by the Conservative Party, with almost unanimous support from Conservative activists in the country. This provided a nationwide field operation, command structure plus enthusiastic evangelists. At the top of the campaign NotoAV produced a series of DL cards with stark messages, such as "he needs bullet proof vests not an alternative voting system". I ordered 50,000 of these which were delivered to activists through our network of constituency and ward organisers, and they were dropping through letterboxes within 48 hours. 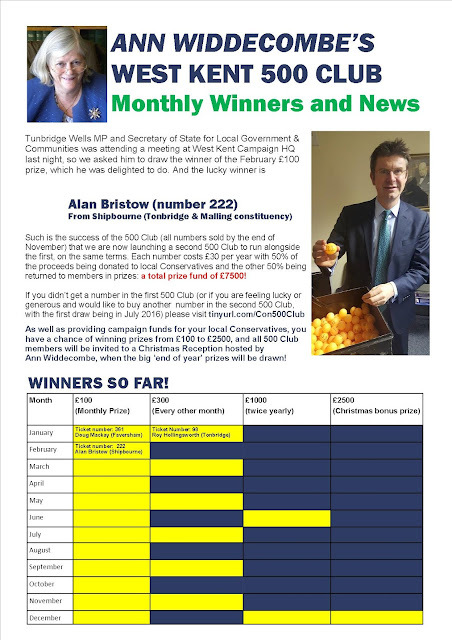 Throughout West Kent every Conservative LG election leaflet carried NotoAV messages, the 20,000 houses canvassed during the campaign were also were also asked to vote NotoAV, and on polling day around 80,000 Conservative pledges received NotoAV GOTV material. Did this make a difference? Unsurprisingly the four West Kent local government areas returned NotoAv votes far in excess of the county, regional and national averages. The Conservative Party has understandable and rightfully in my opinion declared itself neutral in the campaign. As a consequence. 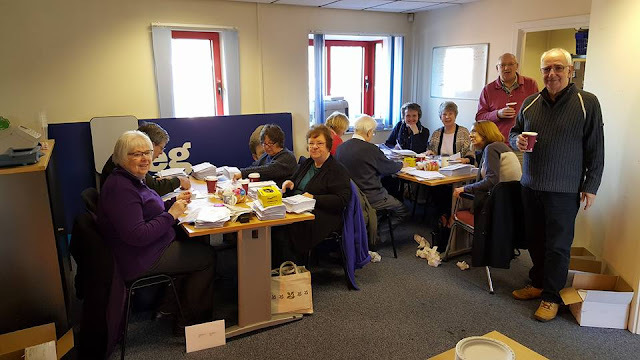 whilst individual members are free to campaign for a Leave vote, no party resources can be used including membership lists, databases or organisational structures. 1. Who would order them? 2. Where would they be delivered and stored? 3. Who would bundle them up into suitable delivery areas? 4. Who would take the hundreds of bundles and deliver them to activists? 5. Who are the activists who will deliver them? 6. Who will keep in touch with the activists to check it's been done, say thank you and sort out problems? In Kent alone there are 750,000 letterboxes. We will need an army of 3,000 volunteers just to deliver one leaflet to each house. 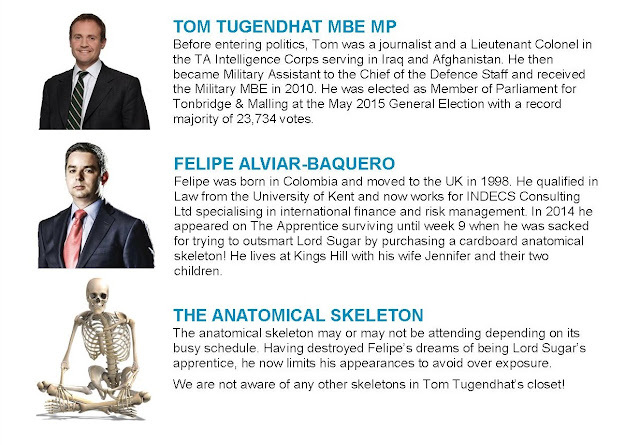 Who is recruiting, training and managing these people? This may seem detailed and trivial when viewed from Westminster, but it is such organisational detail which can deliver that extra 5% which could be the margin between failure and success. Any successful campaign needs a powerful air war to set the tone and narrative of the campaign, but it also needs an efficient and disciplined field operation in each parish, village, town and city. It needs to build coalitions of people who can influence and persuade their peers and reassure the doubters; young people, doctors, faith leaders, shopkeepers, military veterans, farmers, small business owners and so on. But most importantly of all, the campaign must be positive in its language as well as reflective of the whole community. We must campaign positively and confidently that Britain is strong enough, good enough and confident enough to trade and thrive outside the constraints of the EU. If we allow the campaign to become a referendum on immigration and fear then we will fail, and deservedly so. I will not be campaigning for the UK to leave the EU because I don't like foreigners or I don't like different cultures or because I feel threatened. I will be campaigning for the UK to leave the EU because I believe in my country and I believe it can do better as an independent nation trading freely with whoever we choose on the terms we freely agree. I BeLeave In Britain sums my view up nicely.